places you in command of America's fleet of deadly submarines in the Battle of the Pacific that raged from 1942 to 1945! Each submarine under your command has individual skills and unique ratings. You get to deploy your hunters across the Pacific Ocean on the strategic campaign map, then take command of each submarine as it stalks and engages the escorts and merchant ships of the Japanese convoy! Gate Leader includes 4 historical campaigns: 1942 Holding the Line, 1942 Against the Sun, 1943 Turning the Tide, and 1944 Setting Sun. Each can be played in 3 different campaign lengths! Submarine classes include: Salmon class, Gato class, Tambor class, Balao class, and more! 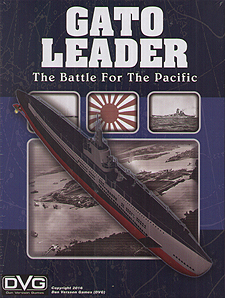 Gato Leader is a Solitaire Game. You command American submarines and make historically accurate decisions, while the built-in game system generates the missions and controls the opposing forces. This means you can play the game at your own pace, whenever, and wherever you choose.